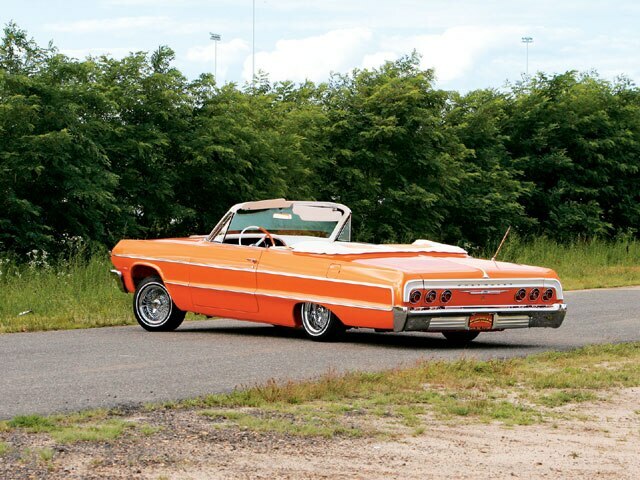 John's Bright Orange '64 Convertible Is Dripping With Lowrider Flavor. John Waite of Camden, Delaware, is a professional horse trainer who knows what to look for in the graceful yet powerful animals. He understands the importance of breeding and bloodlines, and maybe that’s why he’s also an appreciator of vintage ’60s Chevy Impalas, which have a unique purebred pedigree all their own. John’s “Kreamsicle” convertible is a fine example of a ’64 Impala and one of several thoroughbred lowriders that we spotted on the East Coast this past summer. John Pearson is the proprietor of Pearson’s Auto Body in Marydel, Delaware, and he knows how to drive a project vehicle across the finish line. John’s responsible for much of the custom work found on this clean Kreamsicle, including the body work and vivid House of Kolor pearl paint job, as well as the Air Ride Technologies airbag setup. The owner also credits Tony at Southern Plating Specialties in Hialeah, Florida, for the generous amounts of chrome found in, on and under the car. John’s Kreamsicle dream ride has been validated with awards at shows up and down the East Coast, including Best Domestic at the annual Englishtown, New Jersey, Summer Slam event. And he isn’t ready to quit just yet. 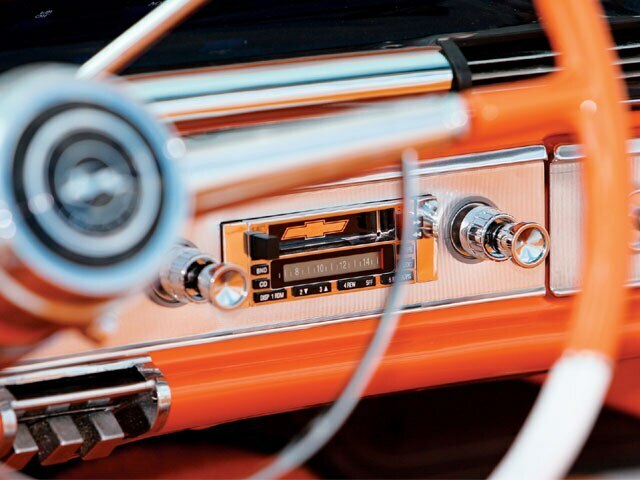 Future plans call for a new audio/video system, pinstriping on the frame, chrome grille and exterior moldings, aluminum radiator, fuel injection and chrome exhaust. This Kreamsicle clearly isn’t ready for a meltdown any time soon. Engine/Drivetrain: The original 283-c.i.d. 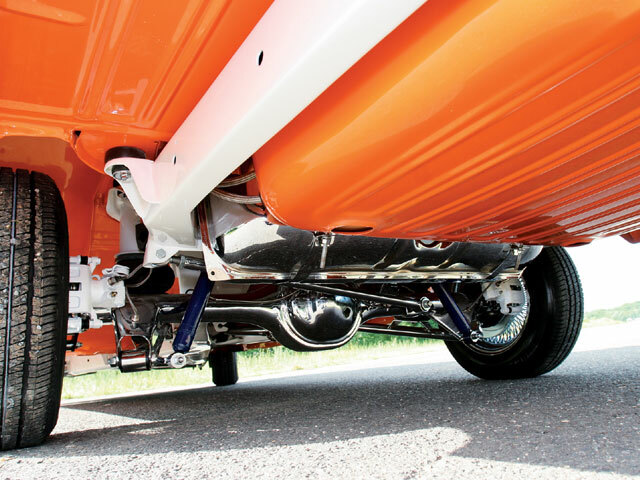 small-block (mated with a two-speed Powerglide transmission) was painted and dressed with chrome-plated accessories by Scott Jones at C&W Auto Parts in Dover, Delaware. Body/Paint: John Pearson at Pearson’s Auto Body in Marydel, Delaware, smoothed the Chevy sheet metal (and molded the floor) before applying House of Kolor Sunset Pearl paint. 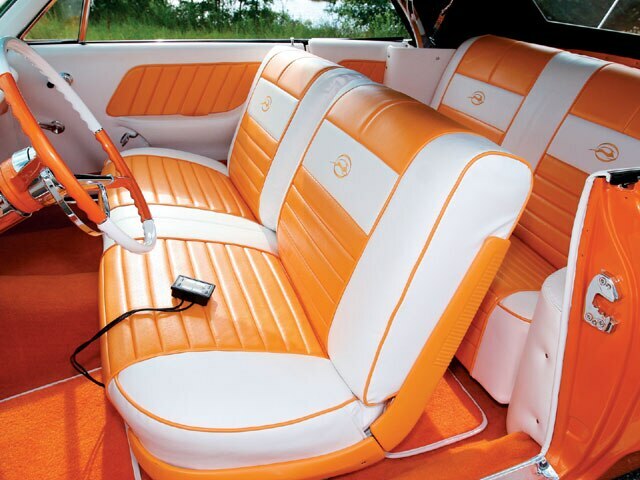 Interior: The custom orange upholstery and door panels with white accents was carried through the interior and trunk (with 3D Impala logo) by Jack Strader of Strader’s Auto Upholstery in Milford, Delaware. 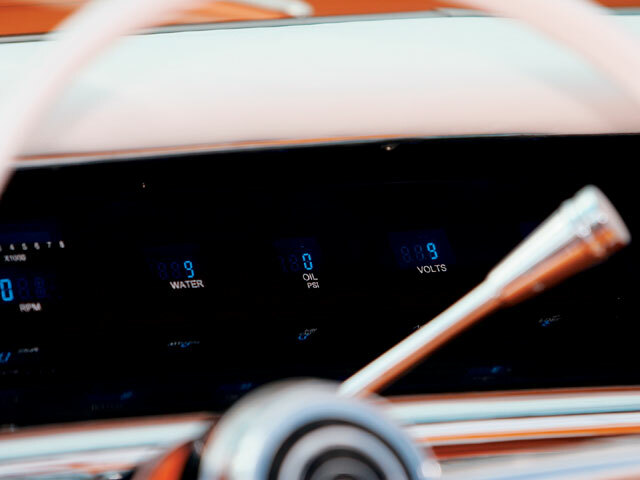 Interior items include a Dakota Digital dash and Ididit tilt steering column. Sound System: John Pearson installed a USA1 radio/CD changer with JL Audio speakers. Suspension: John Pearson reinforced the frame and equipped the car with an Air Ride Technologies four-switch Firestone airbag system.